Wine and Pop: Wilfred: "Uncertainty"/"Comfort"
Wilfred began its third season last night, treating us to two new episodes: “Uncertainty” and “Comfort”. With smart storytelling and a steady flow of jokes, these episodes were a delight to watch and both got me excited for the rest of the season to come. One of the best things that Wilfred has going for itself as a show is the mysterious overarching plot about who or what Wilfred really is. However, since this is the central narrative question of the show, we are unlikely to get any definitive answers until the show’s final season. “Uncertainty” set out to emphasize this point and get both Ryan and the audience to a point where they were willing to accept that. 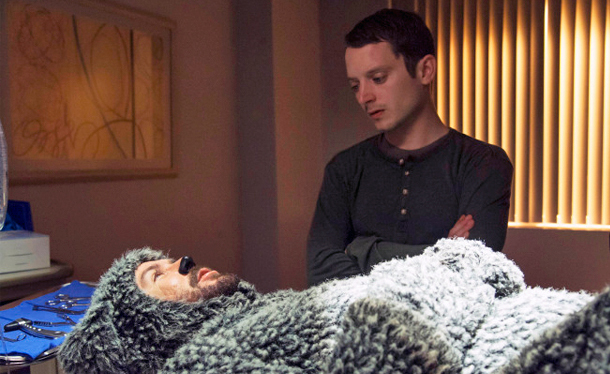 In the season 2 finale Ryan learned that he had been drawing pictures of Wilfred since he was a child. After becoming obsessed with explaining this, Ryan came to the conclusion that most of us have probably thought since season one: Ryan is mentally ill. Always the devil’s advocate, Wilfred disagreed with this notion and instead suggested that he was an immortal being with a bad memory. Determined to prove to himself that he was simply crazy, Ryan decided to track down Wilfred’s original owner and find pictures of Wilfred as a puppy (thus proving that he is not immortal). In line with the theme of uncertainty, the show then revealed new information to us without actually revealing any real answers. Ryan’s trip provided him with evidence that could easily support either his or Wilfred’s theory. In the end, Ryan had to come to terms with the fact that he was unlikely to figure things out any time soon and should just stop worrying about them. As a symbolic gesture, he and Wilfred then burned the pictures of his childhood drawings. It was a nice button on an episode that accomplished what it set out to accomplish in an entertaining way. However, the episode wasn’t perfect. After the symbolic scene of Ryan and Wilfred burning pictures, we were shown a quick clip of Wilfred burying the original drawing Ryan made as a kid. There isn’t anything inherently wrong with this, but I have a hard time seeing how the drawing itself could resurface in the future with any significance. At the moment, this clip seems more like a cheap trick to add mystery and tension where there doesn’t need to be any. Furthermore, the climax of the episode had little to do with the theme at hand; Ryan had to save Wilfred after he accidentally left him with an “abusive” owner (she takes pictures of dogs dressed up as humans). The proper elements for a satisfying climax were all there, but it was still an off-topic climax and thus it came off as a little out of place. Despite these minor flaws, however, the episode was still a solid installment that provided both laughs and a satisfying narrative. “Comfort” dealt with the theme of—you guessed it—comfort. Throughout the episode, Jenna attempted to get Ryan to open up about Amanda so she could comfort him. Not wanting to talk about, Ryan turned instead to the comfort of his new friend, the mailman, to forget about his problems. Meanwhile, Wilfred was devastated to learn that death was a permanent phenomenon and turned to religion for comfort. Even the mailman was forced to face death and turned to denial for comfort. In the end, Ryan, Wilfred and even the mailman learned that the only true comfort in life was accepting your problems and then dealing with them from there. What this episode gained from most was smart structure. Ryan being upset was a logical continuation of last season’s major plot points. Wilfred’s realization about death was a clever mixture of dog jokes and the already present element of Jenna and Drew having been gone. The mailman’s crisis in the face of death, while a bit contrived, was never treated with such seriousness that it seemed too out of place. After introducing the problems each of these characters faced, the episode then transitioned fairly seamlessly into an entertaining second act and finally culminated in a climax wherein each of the three storylines merged. Wilfred, motivated by his religious fervor and hatred for mailmen, followed Ryan to the mailman’s house and attempted to exact holy revenge on the “sinners”. His plan failed, however, and Wilfred lost his faith in God. Terrified by the sight of a wild dog, the mailman and his friends were forced to face the terrible truth that their friend had been killed by a pit-bull. After witnessing both Wilfred and the mailmen move beyond their superficial methods of comfort, Ryan came to realize that he shouldn’t run from his problems either, but should instead accept Jenna’s help and her comfort. Aside from the somewhat contrived backstory of the mailman, this episode was fairly flawless. The storytelling was tight and the jokes were solid. Placed next to the more relevant and compelling “Uncertainty,” however, his episode paled a little in comparison. Ultimately, though, it delivered on everything you could expect from an average episode of Wilfred and left me wanting more.